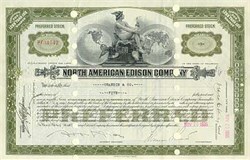 Beautiful engraved Stock certificate from the once mighty (powerful) North American Edison Company for shares of capital stock. This item has an ornate border around it with a vignette of an allegorical man sitting between two globes. This item has period punch cancellation markings. This certificate was issued in the 1930's and is over 60 years old. This will make a nice addition to your collection or a nice gift for someone special.